Children of Resurrection City II playing. From the Poor People’s Economic and Human Rights Campaign. Note: This month, a poor people-led Poor People’s Campaign marched from Philadelphia to Washington, DC and arrived at Dupont Circle last Saturday. They began to resurrect a Resurrection City II in commemoration of the 50th anniversary of the 1968 Resurrection City built in DC after the assassination of Rev. Dr. Martin Luther King, Jr. They protested at HUD against Ben Carson, where one was arrested, and protested the next day at the Chamber of Commerce. They were then evicted from Dupont Circle, with the police citing noise complaints as their excuse. We urge people to share this post and encourage people to show solidarity with the poor people-led Poor People’s Campaign to organize a response with double the number of people participating in another resurrection of Resurrection City II. We urge the Poor People’s Campaign, led by Rev. Barber and Rev. Theoharis, to reach out to them and offer support in resurrecting Resurrection City II. Show solidarity. Contact them through their Facebook page. Below the article from the DC Media Group are videos of the eviction. Prayer Service at Resurrection City II before eviction. Photo by Jamal Johnson of Poor People’s Economic and Human Rights Campaign. 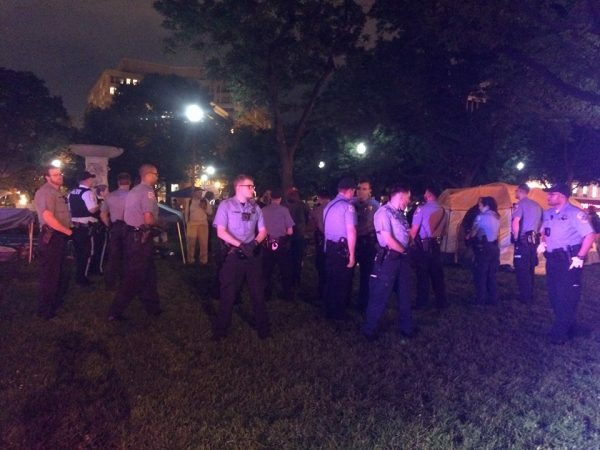 U.S. Park Police and Metropolitan Police Department officers forced a protest encampment at Dupont Circle to disband Monday evening. 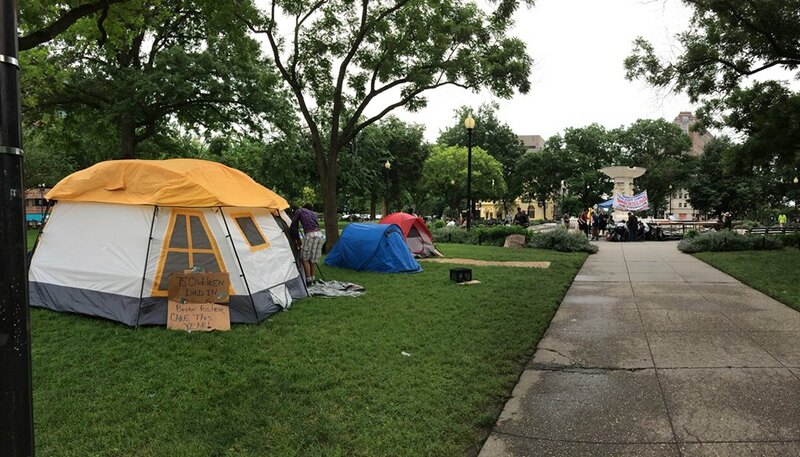 The Poor People’s Economic Human Rights Campaign set up the camp, which they called Resurrection City II, on Saturday to bring attention to worsening conditions experienced by poor people and the homeless. 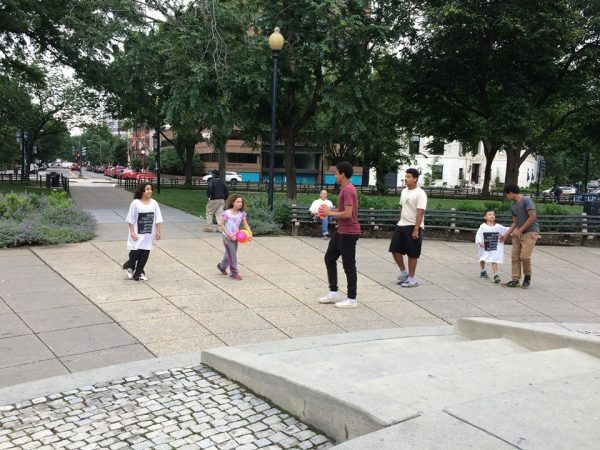 They had obtained a permit from the National Park Service to be in the park until Wednesday. 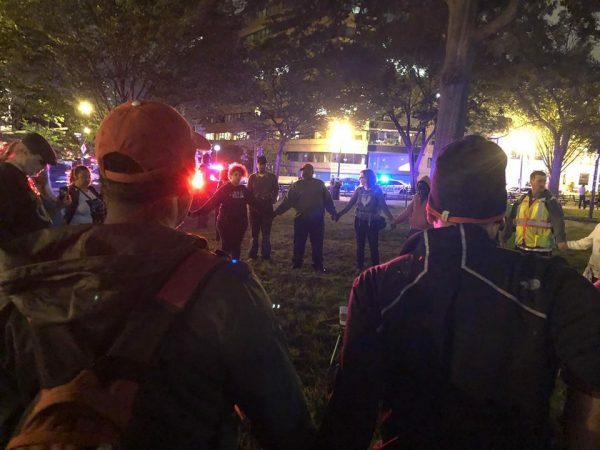 Police began gathering on the outskirts of the park in the upscale neighborhood of Dupont Circle around 7:00 pm but gave no prior warning to organizers that they would soon evict them. No one was arrested, but police confiscated tents and bedding. About 40 people staying in the park, many of them veterans as well as homeless, took refuge at a nearby church on 16th Street. Police cited “noise complaints, permanent structures and obstruction of signs” as reasons to evict them and seize property, according to a PPECHR press release. PPEHRC had set up a stage for outreach to the public to tell about their first-hand experiences with poverty and homelessness in urban neighborhoods. They had also scheduled a series of punk and rap groups to perform original venues to attract hundreds each day to hear their stories. The group had walked from the Kensington district of Philadelphia to Washington, DC over a 10-day period. They had named their occupation Resurrection City II, commemorating the original Poor Peoples Campaign March organized by Dr. Martin Luther King Jr., 50 years ago. The original march of 1968 walked from Baltimore to Washington and formed Resurrection City on the National Mall. Kensington is the poorest district of Philadelphia and one of the poorest per capita neighborhoods in the U.S. with more than 60% of its population either homeless, unemployed, receiving public assistance, or suffering from addiction. Cheri Honkala, co-director and organizer of the Poor People’s March, had been released from custody earlier in the day after she was arrested for refusing to leave a sit-in at the Housing and Urban Development (HUD) headquarters. No sooner had she been released for trespassing than she was dealing with over 20 police officers from the National Park Service and DC Metropolitan Police. Many first time activists took part in the Poor People’s March who had never participated in any protest activity before. They included poor and homeless families, veterans, disabled persons, those with addictions, newly returned citizens, and clergy. Poor Magazine ROCKS! Ever feel that the Plantation Days are still the Plantation Days? The empire sees We the Poor People as property, no doubt!